Despite its shared border with the United States, Mexico still has a challenge with limited English language proficiency. It ranks below several other Latin American nations for English ability (and 38 other countries globally, including Russia, Ukraine, Slovakia, and Vietnam). Further, the Mexican Institute for Competitiveness (IMCO) found that although English is the language of business in Mexico, only 5% of the population speaks or understands it. But interest in learning English is growing. A 2015 study by the British Council – English in Mexico: An examination of policy, perceptions and influencing factors – found that the size of the English language learning market in the country is approximately 23.9 million people, including every level and type of study from public schools to private institutions to self-access channels. This is equivalent to about 21% of the Mexican population. English learning received a big boost in 2009 when the Secretariat of Public Education launched the Programa Nacional de Inglés en Educación Básica (PNIEB), which aims to increase the English proficiency of public school students by offering classes spanning pre-primary to the end of secondary school. Based on the successful Project English in India, PNIEB first produced 350 teacher trainers, who in turn trained 17,000 English teachers, who then taught about 800,000 students. On the higher education front, both public and private institutions have become more internationalised than was the case in the past, a trend that began in the 1990s. University administrators see English as one of the most important tools for enabling students to reach their academic potential, and also as a key to mobility, research collaboration, and partnerships. Nowadays, nearly half (48%) of Mexican universities feature English-taught programmes. “English is most widely studied during mandatory school education, undergraduate study, and via private tutoring to improve employment prospects,” adds the report. The British Council explored the motivations of English learners, and found strong correlations between occupation, level of education attained, household income and access to English language learning. In a related survey, more than 70% of managers, engineers, workers in the legal professions, computers and math, business and finance, architecture, engineering and other top level professions had studied English. Workers in arts, design, entertainment, sports, media, and architecture also topped 70%. Conversely, only around half of respondents who were manual labourers, unemployed, or had generally lower levels of educational attainment had studied English at some point. 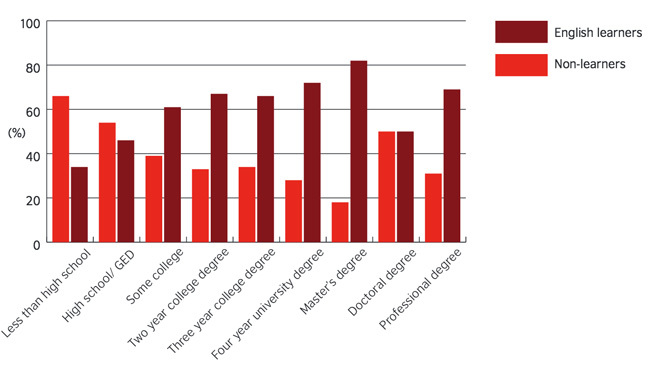 As the following chart illustrates, there is also an apparent linkage between English ability and education levels. Of those who studied English, 65% had done so at the secondary level and 61% at undergraduate levels, with those two figures amounting to greater than 100% to reflect classes taken across more than one academic level. About 43% had taken classes at a private English language school, while 38% had studied it during primary school. Those four groups made up the vast majority of learners. Recent-year mobility figures further underscore how important English is for Mexican students. Of the 28,866 tertiary students abroad by last count, the majority were in English speaking countries, with the US on top with approximately 14,000 students, followed by the UK with 1,560, Canada with 1,338, and Australia with 587. To put this outward mobility toward English-speaking nations in perspective, consider that 2,470 students went to Spain and 867 to Cuba. In terms of English Language Training (ELT), Mexican students accounted for about 192,111 student weeks of ELT abroad in 2013, making Mexico the 18th-largest ELT market worldwide. Reflecting the national push toward greater English proficiency, the number of outbound ELT students rose 35% between 2011 and 2013, with most Mexican students studying English abroad remaining in North America: more than 40% of student weeks abroad in 2013 were spent in Canada, and another 30% in the US. However, as English language learning spreads, students are likely to look abroad in increasing numbers. A 2015 presentation by international research firm StudentMarketing underscores local preferences for overseas study opportunities, noting that, along with the drive to learn English, Mexican students are concerned about high crime rates at home as well as the poor quality of local universities. As noted above, English proficiency is seen as a key to boosting personal employment and advancement prospects, but important barriers also remain for many who would like to study. For example, exactly half of respondents to the British Council survey said the main obstacle is cost. Looking at the above responses it becomes clear that, among survey respondents, lack of interest is not a primary factor in non-enrolment. IMCO research in this area finds that in the case of workers who study English, fully 45% decided to do so on their own initiative, while only 37% did so because they were required to by employers. Thus, available data describes not only a robust and growing market for ELT in Mexico at pre-tertiary, tertiary, and professional levels, but also points to a large – and possibly underserved – market of adult learners. Among younger people, English is often seen as a positive because of the social status it affords and the access it provides to popular culture. For the Mexican government, and for the business sector as well, English proficiency is clearly seen as a key for national growth, and a skill needed for the country to engage with the globalised economy and to allow the international community to invest in Mexico. For additional background on this important market, please see our 2015 market snapshot. This entry was posted in Language Learning, Mexico, North America, Regions and tagged boarding schools, international students, language schools, language learning, youth employment.